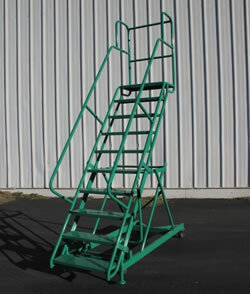 The quick assembly of the Folding Rolastair™ makes it unique to others in its class. 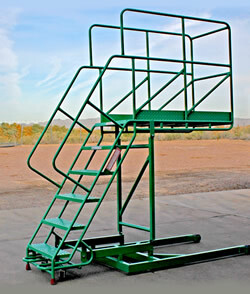 This mobile rolling ladder is shipped knocked down to reduce costs on shipping, and can be quickly assembled when arriving onsite. 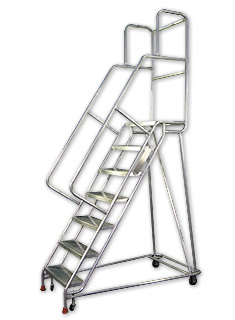 During use, the Folding Rolastair provides mobile access for personnel working with various materials, racks, and equipment. Traction Tread (Standard on RolaStair) – Provides greater non-slip protection than diamondplate. Diamondplate (Standard on Super Duty RolaStair) – Provides anti-slip protection through use of raised diamond shaped ribs on a fully closed step surface. 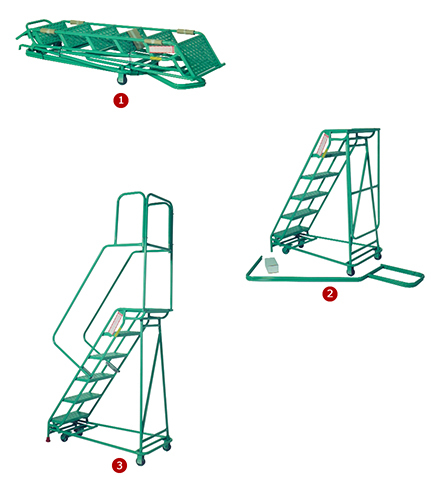 Safety Grating – Provides maximum non-skid protection in wet and/or dry conditions. All of these models are shipped fully folded to reduce shipping cost. 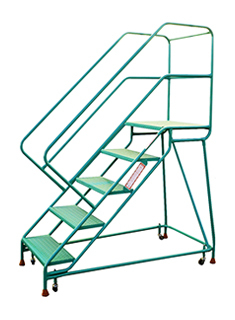 All are provided with Stepjack foot controlled floor lock assembly. 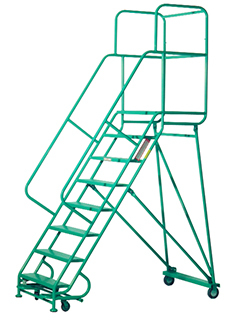 3-1/2″ swivel casters are mounted on the StepJack. 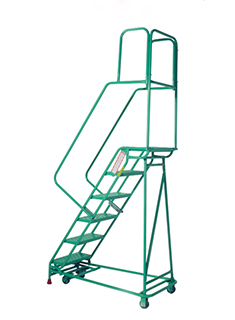 These models have 3-1/2″ rigid casters located under the platform. 31″W x 48 1/2″D 82 lbs. 31"W x 55 1/2"D 89 lbs. 8 F26H8 76″ 26″ 118″ 30″W x 62″D 122 lbs. 9 F26H9 85-1/2″ 26″ 127-1/2″ 33″W x 69″D 135 lbs. 10 F26H10 95″ 26″ 137″ 36″W x 76″D 142 lbs. 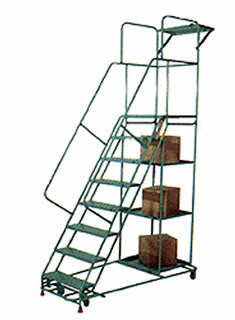 These models have 5″ rigid casters located under the platform. We couldn’t find a standard catalog ladder that would fit in the narrow space and let our operator reach the top of our printing press. 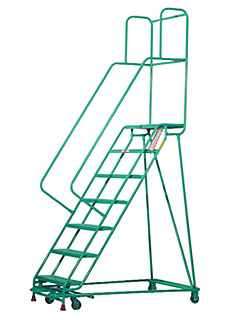 We needed a custom ladder and the guys at Ladder Industries (now Wildeck Access) quickly designed exactly what we needed. When the ladder arrived, we were impressed with the perfect fit.